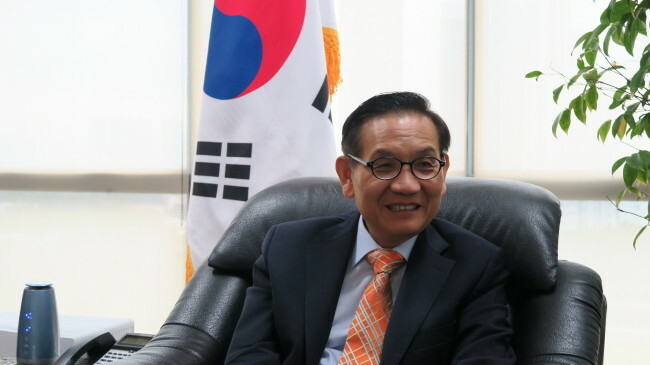 SINGAPORE -- The Association of Southeast Asian Nations has become an important partner for not only Korea’s prosperity, but also for its peace, Korea’s Ambassador to Singapore Ahn Young-jip said in an interview with The Korea Herald. “ASEAN has expressed its views on the Korean Peninsula through various summits, and has been showing great interest in the stability, peace and prosperity of the Northeast Asian region,” Ambassador Ahn said Friday at the embassy here. President Moon Jae-in arrived Tuesday night in Singapore, where he will attend a series of regional summit meetings led by ASEAN through Friday, before visiting Papua New Guinea over the weekend for the annual Asia-Pacific Economic Cooperation forum. Moon will offer to host a special summit with ASEAN next year to commemorate the 30th anniversary of Korea’s partnership with the regional bloc. He will also suggest a summit between Korea and five countries along the Mekong River. “Discussion on this matter has been ongoing this year, and Singapore has been playing a leading role in uniting ASEAN’s support for the commemorative summit,” Ahn said. Singapore has also proposed establishing the ASEAN Smart Cities Network under the theme of innovation and resilience, and this is an area in which Korea can make a meaningful contribution based on its experience and know-how, the ambassador added. Having maintained diplomatic ties with the Democratic People’s Republic of Korea since 1975, Singapore has held a series of high-level talks as well as various nongovernmental exchanges with North Korea this year since the US-North Korea summit here in June. “I believe North Korea can benefit from its relations with Singapore, not only by learning from its experience, but also by seeing the benefits of becoming a responsible member of the international community,” Ahn said, noting that Singapore’s positive qualities, such as openness, efficiency and respect for global rules-based order, helped build the city-state into what it is today. Consultations between ROK and Singapore on issues related to the Korean Peninsula remain active on all levels, according to Ahn. “Each time I meet with officials from the Ministry of Foreign Affairs of Singapore, the conversation would always cover the situation on the Korean Peninsula. Naturally, we would talk about the recent developments and discuss how our two countries, as well as Korea and ASEAN, can cooperate on this issue,” he said. The ambassador said that South Korea and Singapore closely cooperate when there are official exchanges between Singapore and North Korea, such as the DPRK’s Foreign Minister Ri Yong-ho’s visit to Singapore for the ARF Foreign Ministers’ Meeting in August and Senior Parliamentary Secretary at the Ministry of Foreign Affairs and the Ministry of Trade and Industry Tan Wu Meng’s visit to Pyongyang on the 70th anniversary of the DPRK’s founding in early September. At the request of Singapore’s S. Rajaratnam School of International Studies, Ahn gave a lecture at the school in September on the history of the North Korean nuclear issue and the latest developments on the Korean Peninsula. “As the lecture took place just a week before the inter-Korean summit in Pyongyang, there was a great deal of interest in the expected outcome of the summit meeting and the role of ROK in realizing peace and denuclearization,” he said. To cultivate more expertise on Korea among academics here, the South Korean government conducts various programs, co-hosting forums and seminars, and funding research in academic institutions in Singapore. “Given the aim of building a people-centered future community with ASEAN under the New Southern Policy, I believe more should be done to enhance cooperation between scholars, experts and institutions of the two countries,” Ahn said. In terms of support for private businesses under the New Southern Policy, the South Korean government focuses on helping expand exports to Southeast Asia, from fresh produce to high-tech manufactured goods; assisting Korea’s traditionally strong construction companies in winning more orders; and sharing its smart city model with the region. ASEAN is Korea’s second-largest trading partner after China, with two-way trade volume reaching nearly $150 billion last year. The ASEAN region is also by far Koreans’ favorite tourist destination.